GRAMMY Award-winning San Francisco pop-rock band Train returns to Wolf Trap after their last appearance in 2011. Their recently released album, California 37 (2012), debuted at No. 4 on the Billboard 200 and featured the Top 10 single “Drive By.” Formed in the mid-90’s, the band got its breakthrough with their eponymous debut album in 1998. “Meet Virginia,” the second single from the album, peaked at No. 20 on the Billboard Hot 100 and became the first Top 20 hit for the band. Train followed their successful debut with 2001’s Drops of Jupiter, which debuted at No. 6 on the Billboard charts. The single “Drops of Jupiter (Tell Me)” earned the band their first GRAMMY Award for Best Rock Song in 2002. Fusing hip-hop influences and folk guitar playing to create his unique style, singer/songwriter Mat Kearney returns to the Wolf Trap stage as the opening act—his second time for Train. Kearney is currently touring in support of his latest album, Young Love (2011), which features the smash single “Hey Mama.” In 2006 Kearney released the hit single “Nothing to Lose” from his second album of the same name. The track charted at No. 21 on Billboard Hot Adult Contemporary Tracks and peaked at No. 41 on Billboard Hot 100. The single was also featured in the movie trailer for Catch and Release (2007) and the hit TV show Grey’s Anatomy. American jazz saxophonist Dave Koz returns to the Wolf Trap stage after his last performance over a decade ago. His latest album release, Hello Tomorrow (2010), peaked at No. 1 on the Billboard Jazz Albums chart and received a GRAMMY nomination for Best Pop Instrumental Album. He made his record debut in 1990 with his self-titled album—his first venture as a solo artist. Koz has recorded several gold-certified albums over the past two decades, becoming one of the first instrumentalists to release hit singles as well as full albums. Two decades after his last appearance at Wolf Trap, gospel singer BeBe Winans returns to the stage alongside Dave Koz. His latest album release, AMERICA AMERICA (2012), features a collection of classic and original patriotic songs. Raised in a musically gifted family, Winans began his career with his sister CeCe; the duo released their debut gospel album, Lord Lift Us Up, in 1984. They went on to release nine more albums, including Still in 2009 and have won three GRAMMY Awards. Winans began his solo career in 1997 with the release of his self-titled debut album. Since then he has won 10 Gospel Music Association Dove Awards and three additional GRAMMYs, including one for Best Gospel Vocal Performance. Scottish funk and R&B group the Average White Band (AWB) perform at Wolf Trap for the first time in five years. Shooting to fame in the early ‘70s, after they opened for Eric Clapton’s Rainbow Concert at London’s Rainbow Theatre in 1973, the band released their single “Pick Up the Pieces” which reached No. 1 on the Billboard Hot 100 Chart in 1975. AWB continued to experience success with their follow-up albums, Cut the Cake (1975) and Soul Searching (1976), each producing Top 40 Hits. AWB has been sampled on over 100 Hip Hop and R&B songs—making them the 15th most sampled act in history. New Jersey quartet Frankie Valli & The Four Seasons return to the Filene Center stage for an evening filled with doo-wop hits. The group released their debut album, Sherry & 11 Others (1962), which included the Top 10 hits “Sherry” and “Big Girls Don’t Cry.” As a group, Valli and The Four Seasons have sold over 80 million records worldwide and scored 29 singles in the Billboard Top 40. Beginning his solo career in the ‘60s, Valli found success with the hit singles “Can’t Take My Eyes Off of You” (1967), “My Eyes Adored You” (1975), and platinum-selling “Grease” (1978). Though the group disbanded in 1979, they were later inducted into the Rock and Roll Hall of Fame in 1990. The Broadway musical Jersey Boys, based on The Four Season’s history and featuring a variety of their classic hits, debuted in 2005 and won three Tony Awards. American gospel and soul singer Al Green returns to Wolf Trap after his last appearance in 2008. His most recent release, Lay It Down (2008), was his first Top 10 album since 1973’s Call Me. Green made his solo debut with the record Al Green Gets Next To You (1970), which included the hit single “Tired of Being Alone,” the first of seven consecutive gold-certified singles. Continuing to gain popularity throughout the ‘70s, Green released three back-to-back hit records, Let’s Stay Together (1972), I’m Still In Love With You (1972), and Call Me (1973). In 1976 Green became an ordained pastor of the Full Gospel Tabernacle in Memphis, and began his gospel music career, releasing his first gospel album, The Lord Will Make a Way, in 1980. Over the course of his career Green has released over 25 albums, sold over 20 million records, and won 11 GRAMMY Awards. He is an inductee of the Rock and Roll Hall of Fame and was voted one of Rolling Stone’s 100 Greatest Artists of All Time. GRAMMY award-winning blues musician Taj Mahal returns to the Filene Center stage as the opening act for Al Green. Born as Henry Saint Clair Fredericks, Jr., Mahal was exposed to music at an early age— his mother was the member of a local gospel choir and his father was a West Indian jazz arranger and piano player. He began his career in the mid-‘60s when he formed one of the first interracial band of the time, the Rising Sons, with Ry Cooder and Jessie Lee Kincaid. The group later disbanded and Mahal began his solo career—he released his self-titled debut in 1968. Mahal became known for his unique blend of Reggae, jazz, zydeco, West African, and Hawaiian influences. Over the course of his 50-year career, he has composed films scores, performed with The Rolling Stones, Etta James, and Eric Clapton, and received nine GRAMMY nominations, winning two GRAMMY Awards for Best Contemporary Blues Album in 1997 and 2000. Back by popular demand—join in the fun with Sing-A-Long Sound of Music. The original film will be screened in its entirety, on full HD screens located on the lawn and in-house, and accompanied by the original soundtrack. A hilarious host will lead the audience through various sing-a-longs, a costume contest, and other fun activities. Making their Wolf Trap debut, the all-male a cappella group Straight No Chaser bring their catchy vocal versions of classic favorites and contemporary hits like “Hallelujah” and “Rhythm of Love.” Formed in 1996 at Indiana University by 10 friends, the ensemble became the first all-male a cappella group at the university. A YouTube clip of their 1998 performance of “12 Days of Christmas” caught the attention of the Chairman/CEO of Atlantic Records in 2007, who offered them a recording contract. Straight No Chaser has since released three albums, including 2010’s With a Twist, which peaked at No. 29 on the Billboard 200. Tickets can be purchased by calling 1 (877) WOLFTRAP; or online at http://www.wolftrap.org. 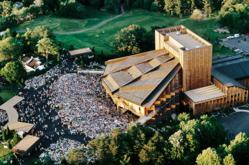 For more information, call Wolf Trap at (703) 255-1868.